Robert d'Unienville, the most illustrious Mauritian bridge player, died at the age of 68 on the 20th February following a short disease. His death came just three weeks after Terence Reese, one of his team-mates of the British teams of the fifties. D'Unienville had a highly zuccessful partnership with Alan Truscott, IBPA Chairman, while he was studying at Oxford University. 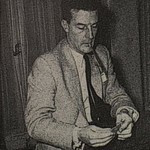 d'Unienville, with Truscott, was in the British team which took third place in 1951 European championships in Venice. Truscott wrote later that Robert would have been amongst the world top players if he had not returned to his home of Mauritius. But Mauritius will always be grateful to Robert for having made such a choice. He was, without doubt, the best mathematics teacher that the country has known. He was also the expert on ACOL that spread the system throughout the island. Robert had a prodigious memory, and his analysis was clear and faultless. We all enjoyed post mortems. He also had an acute caustic sense of humour and liked to share with us his rich and diversified culture. trumps to go one down. Gambling that the clubs would run, d'Unienville scored a coup when 3NT proved to have nine winners.